So many quilts. So many naps. Tis’ the season for cozy couch cuddles ya know? The kids painted picture frames for gifts this year as a part of our handmade holiday. I printed out a black and white photo of the three of them so their colorful painting swirls could really pop! We found the wood frames at Hobby Lobby and used different shades of pink, red, and green acrylic paint. I know it’s kind of trendy right now, but I will forever love ticking. It’s become a classic design pattern in our home and I am trying not to overuse it – but I could not resist these Etsy stockings. So cute! So a funny story for you… Two years ago when I purchased these little gems I decided to get four, you know, in case we ever decide to have another baby. Ha! Anyone else guilty of that? It was Christmas Eve and our stockings hung by the chimney with care, and Andrew decided to toss a small cardboard box into the fire to keep it rollin’. Well before we knew it the box fell out of the fireplace and in efforts to get it back in, he knocked one of the kid’s stockings in the fire! It just so happened we were hosting family that evening, and everyone was like, “Oh, that’s too bad. 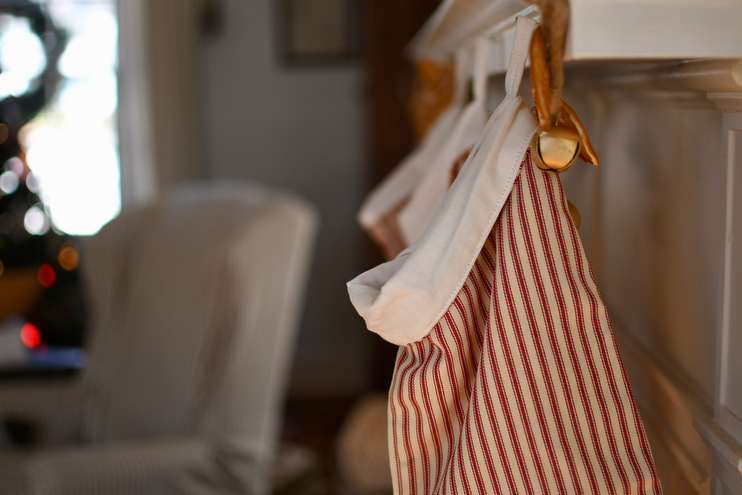 One of the kids won’t have a stocking now.” Remembering that I had one tucked away for our future maybe baby, I rushed downstairs and came up with a brand new red ticking stocking. “Not to worry, everyone! We have another!” I am pretty sure each of our surrounding neighbors could hear the howling laugher coming from within our home! I would have a back-up stocking. It was such a funny moment and everyone all jokes that we must have a little elf working away in the basement sewing projects for me on the spot. This was our Advent calendar this year. It included a lot of ways to serve our community and be a helpful and kind presence to others. We are going to follow it next year too, and it was made without purchasing anything! Zero-waste crafts for the win. You can find the tutorial here. Have you ever made soap? I have been dabbling in the art of soaping(?) this winter and it has been fun! These bars are exfoliants made with oat powder and crushed almonds. I enjoy adding a few drops of essential oil to each as well, and decided on orange and pine for these holiday gifts. We topped them with a dried orange slice, wrapped them in fabric, and gifted them to teachers and friends. I will be sharing more soap-making tutorials come spring! I have been making a batch of morning muffins every week for awhile now and they’ve been a big hit with the kids. These were made with fresh carrots, zucchini, oats, milled flax, maple syrup, almond flour, and various spices like cinnamon and vanilla. Here’s a little tip: kids LOVE individual portions and making things in little cupcake molds is a nifty way to get them more excited about their food. Even when it contains secret ingredients like vegetables! Oh, and another thing we’ve been making together at home is corn tortillas. Andrew and I learned how to make them while taking a cooking class in Mexico and we thought it would be a fun thing for the kids to try back home. Turns out it’s the easiest thing ever, and they taste better than store-bought! All you need is masa + water + a pinch of salt. Form dough consistency, flatten, and then cook on an oiled skillet. Easy peasy. What is it about boys their truck obsession? Before we became parents Andrew and I swore we wouldn’t give into gender-bias stereotyping, but our boys love anything loud with wheels. They just do! And Stella, well she loves pink and red and mothering her baby dolls. We got the boys dolls too, and while they play with them sometimes, it’s nowhere near the amount of time and imaginative play they engage in with their tools and trucks. Head-to-toe in pink, dragging firewood. That’s my girl. I love how helpful she is, always asking is there’s something she can do for our family. I have really been into cooking from cookbooks lately and my new one has been full of healthy seasonal meal ideas with guiding inspiration for these cold winter months. Give us all the beets, please. The kids and I were playing together outside one evening a few weeks ago waiting for dad to get home when the sky overhead turned into all these thick layers of pink, purple, and orange. While this photo sort of captures its beauty, nothing can quite capture the magnitude of awe we experienced, standing there in the front yard, eyes to the sky full of wonder. I got that big enamel pot from our neighbor’s garage sale for ten bucks. We use it darn near everyday, for soups, stocks, boiling vegetables, and just about anything else you can think of to feed a family of five. Just a little note to say, things don’t have to be pricy to work well. I’ve sources so many of our kitchen items from second-hand shops and sales, and they have all been worth the hunt. In that photo I can see five things (including our white stock pot) I purchased/was given secondhand or while on a thrifting adventure: the still-life photo, long brush holder, enamel tray, short brush cup, and the pot holders that were made with scrap fabric by my great grandmother. I love the story these old items weave into our home. And I love even more that we were able to find a use for something that another person discarded. What a wonderful way to tread lightly on this beautiful earth! How much is too much screen time? Does your family have rules in place for watching shows or movies, or do you guys just role with it and let the cards fall where they may? I am going to be sharing how our family incorporates screen time into our days this month, but here’s a hint: it’s incentivized! We crafted those little peg dolls this season and they live in the boy’s room. I think they’re really sweet. Despite the sweetness that is a sleeping toddler, I think we are on the verge of phasing out nap times. 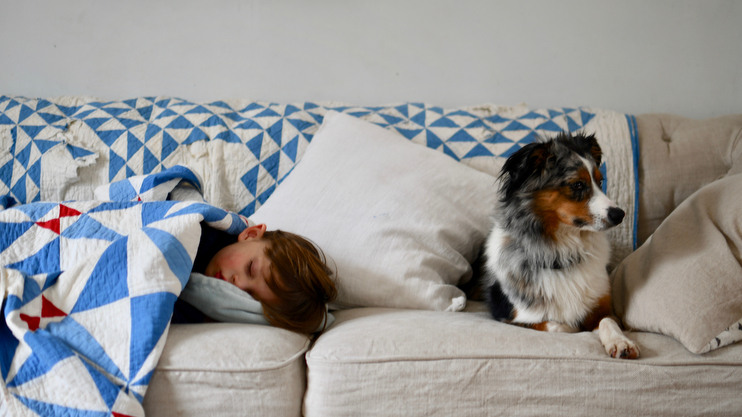 Each of our kiddos have responded very differently to naps, and I think this conversation lends itself to intuitive parenting, and not something you should or even can quantify! Stella stopped around age 2, Theodore STILL naps and he’s four, and Alfie will be 3 in June. When you have little ones sleep is a very big issue, but take heart if you have a non-napper…that just means they head to bed earlier, right? One can hope. Here’s a little peek at homeschool mornings with dad. A few days a week we all work together for a bit on some lessons with Stella, the boys usually climbing on us or racing cars down our backs. But we love it. It’s wild but we are together, basically this season of life summed right up! We haven’t gotten a lot of snow this winter per se, but when there’s a dusting you can bet Stella Vivienne is out playing in it! She told me the other day, “My favorite season is all of them.” Me too, sweet pea. New things this gal has learned in the kitchen this season: how to operate a can opener, make scrambled eggs, the proper amount of salt needed to make flavors pop (aka, only a teensy bit! ), how to load the dishwasher, simple knife skills, the art of tortilla making, and how to lick all the batter off the whisk when we make baked goods. I love age 6. I also love kid drawings that include flowers, gnomes, fairies, and toadstools! Stella got a portable piano for Christmas this year and it’s been one of her favorite gifts. We are considering starting piano lessons for her this spring, and I love the idea of adding a real piano to our home. I grew up playing one at my grandparents house and it was always something I looked forward to when I visited. And what would winter be without piles of clementine skins and lots of indoor crafting?! 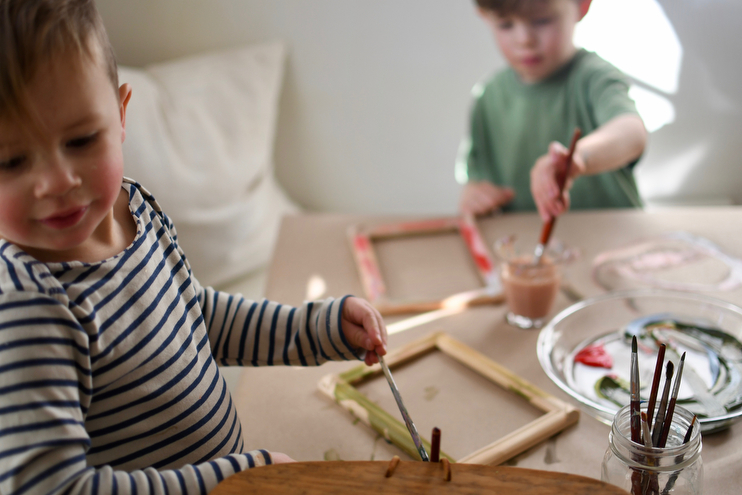 We alternate crafts depending on the day and our rhythm, and watercolor days are our favorite. I am at the point where I am not sure what to do with all their artwork, and am thinking it would be wise to invest in a scanner to keep the ones they really love (and I really love) on file…have you done this? Any art-sorting tips welcome! These are my favorite posts:) I always love seeing how others live their days and connecting to ideas. My daughter just turned 7 – first grade and this age are so sweet, and I’ve been wanting to get her into the kitchen more with me. She helps out with baked goods (especially the spoon-licking part), but I’m inspired to give her some opportunities to create a little bit more; make some (simple) meals on her own. This year, we wrapped our gifts (teachers and extended family) in either plain craft paper that we topped with one special 5 x 5 photo, or we wrapped them in tea towels. I found some pretty and simple blue and white tea towels from Ikea, then wrapped up a whole bunch of gifts with them. For whatever reason, doing that brought me a whole lot of aesthetic satisfaction! Knowing that everyone could reuse the wrapping was satisfying, too. And piano thoughts; we started our daughter with some really light lessons with her music teacher last year. We’re keeping it light and just letting her enjoy creating sound, while also getting some of those basics of reading music and notes. (Bonus: I’m learning too, as I’m asked to be present at the lessons!) We scored a free piano (I’m always surprised at how often I see them in the classifieds for free! ), had it tuned for about $80, and I love hearing the sound of it at home. It’s one of those instruments that is hard to make sound unpleasant! • Funny question, but I’m also really curious where your kids get their toadstool/fairy/gnome inspirations- Elsa Beskow, David the Gnome, other books/shows? I loved that stuff as a kid, but wonder how to incorporate that magic for mine these days. Amanda, thanks so much for the replies! I didn’t realize there were kid aprons like that at Hobby Lobby (and that’s where I bought the material to make her one, haha!). Don’t have kids but I love your photo’s. I followed along on the rest retreat as well. and thank you so much for leading it! My question is, where is your round rug in the living room from as well as the coffee table?